The generational makeup of our legislature is shifting, and it will definitely affect our future as we move further into the crisis. This covers only up until 2005 (you can also download a spreadsheet with their source data – very cool!) so I captured the information for 2007 and 2009 from the Congressional Biographical Directory and created a couple charts showing the recent trends. 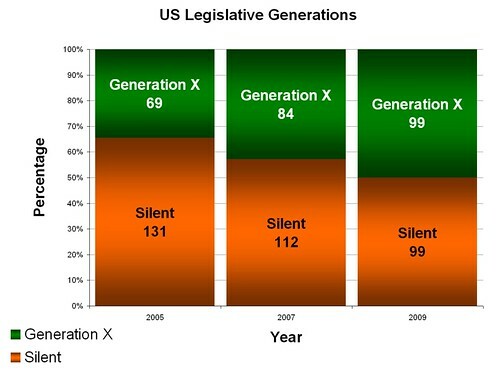 Generation X now equals the Silent Generation in Congress, up from around only 35% just four years ago. The shift from Boomer to Generation X will likely take many more years. The significance of this shift is important. The Silent generational leaders are very knowledgeable, but are not known for decisive action. Generation X, on the other hand, is very practical and won’t get caught in “analysis paralysis”. Gen X leaders often go with their gut and are willing to try things out and evaluate as they go along. This will probably make for faster decisions in congress, but might also mean that those decisions are not as well thought out. You may also notice that there are not any Millennial generation (born 1982~2005) leaders in the Legislature yet, but I expect there will be several in the next congress. There has been a lot of talk about Obama’s generation lately. Many demographers would say he is a Boomer (the strict definition of the Baby Boom goes through 1964) others (myself included) say he is a Gen X’er (based on the definitions of Strauss and Howe). Others categorize him as part of a newly discovered generation, Generation Jones. For me the interesting thing is not the name of the generation he fits into, but the character of that generation when compared with the past. One of the main features of the generational theory put forth by authors William Strauss and Neil Howe is that there are repeating “archetypes” or characters of generations throughout American history. There are four archetypes they identify: Artist, Prophet, Nomad and Hero. Each carries its own signature style and has specific attributes depending on what age bracket they are in at the time. I have two webinars (part 1 and part 2) that can be useful for an understanding of the generational cycles if you want to know more about them. The other important feature of their theory is that there are “turnings” or cycles in history where certain events are likely to occur. These are the High, Awakening, Unraveling and Crisis. We are currently in the Crisis phase according to their theory, having recently moved out of the Unraveling. Again, if you want to get an overview of these turnings refer to my “start here” page or the Lifecourse site that Howe and Strauss put together. 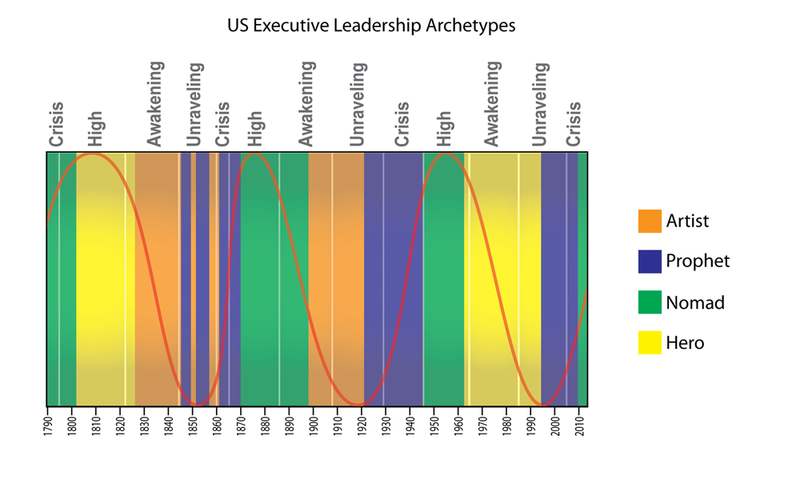 Thinking about the archetypes and turnings in US history, I created a spreadsheet that contains the generational archetypes of each of the US presidents. It also has the turning during which they started their presidency. And finally, it contains the “ratings” of each president based on expert ratings (found on Wikipedia ). The Red color in the ratings section refers to the bottom quartile of ratings, while the Green refers to the top quartile. Playing around by sorting the results generates some insights. The top three presidents according to most of the surveys came from Crisis eras (Washington, FDR and Lincoln). 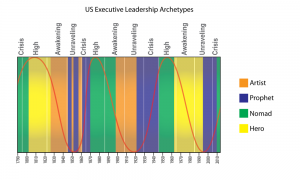 By contrast, the Unraveling periods produced consistently low results for most of the presidents during those periods (Woodrow Wilson was the one exception). 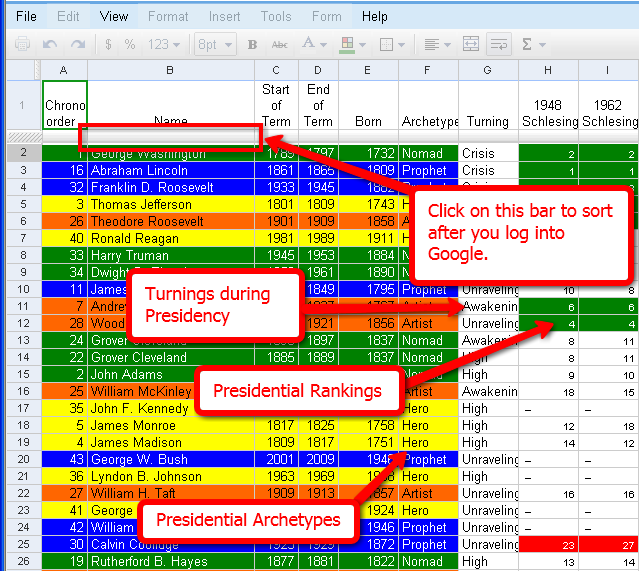 If you try sorting by Archetype (select that column, go to Tools>sort by colum Z -> A, or just click on the bar below the title of the column – again, you must be signed into google to use this function) you will see that Prophets contain mainly either top or bottom ranked presidents; there are few that are in the middle. This fits well with the polarizing character of Prophets. Heroes have lots of highly ranked presidents and only a couple in the bottom quartile (Carter, Nixon and Ford). Nomads are less remarkable in their presidencies and with just a few exceptions don’t rank in the top or bottom quartile much at all. Artists are similar to Prophets in that you either love them or hate them. So what combination of Turning/Archetype creates a great president? It’s hard to tell, but it is clear that Prophets that preside during an Unraveling don’t fare very well (Fillmore, Pierce, Harding and Coolidge), a trend that is likely to be born out by our previous two presidents (G.W. Bush and Clinton, both Prophets in an Unraveling) once we can look back on this period with a historical eye. Prophets can do amazingly well during a crisis (FDR and Lincoln) but also really badly (Hoover and Johnson). Presiding over an Unraveling, when society is falling apart, is unlikely to reflect well on a president regardless of their archetype. Hero’s seem to do well during a High (Jefferson, Madison, Kennedy, Johnson) but less so during an Awakenign (Carter, Ford and Nixon). Take a look at the chart, do some sorting and poking around and give me your insights and observations. Many people feel that our society is falling apart and are putting great effort into bringing it back together. The problem is that when we are blind to the signs of real change, we tend to miss our target and over-correct. It is likely we will follow this same pattern in the next 10-15 years. Generational research purports that history turns in specific cycles and by understanding those cycles we can predict what society might be like 10, 20 or even 50 years in the future. If that sounds something like hokey astrology to you, then you are probably a linear thinker. And linear thinkers are exactly what fuel the cycles that generational research is about. The work of William Strauss and Neil Howe (including their books Generations, The Fourth Turning and Millennials Rising) all talk about the cycle of generations and the “turnings” or social periods that result from those generations. Most of their work focuses on the generations in the United States, but their theories apply elsewhere as well. The reason they apply so well in the US is that we, as a society, tend to be very linear in our thinking, which creates higher highs and lower lows in our social changes. So what would you guess for each of these factors (the full list in the book is much longer)? How did you do? Many people in our society would guess the exact opposite: that all these factors have been, and are, increasing. Part of that is because of media reporting, but the larger responsibility is the fact that we can’t help extrapolating in a straight line from our past. In the years BEFORE 1995 we saw a consistent increase in the factors mentioned in the chart. Because of this we assume that this trend will continue even when the statistics tell us otherwise. This tendency to believe that when things are bad that they are only getting worse creates a strange dynamic in society. The feeling that our society continues to fall apart make many people (particularly young people such as the Millennial generation born 1982-2005) fight hard to change the direction of society. This is important and admirable, but failing to recognize when change is actually occurring makes it so we overshoot our target. A good example is the Awakening of the 1960’s. The rebellion by the Boomers (born 1943-1960) against the “establishment” (the GI Generation born 1901-1924) started the fragmentation of society. This continued for the next 20+ years and got more extreme at every turn because we failed to recognize that society had indeed changed! Many people continued to push for further change, for further breaking down of institutions and for further individual freedoms. The pendulum swung completely to the other side, and then well beyond! Because the rebellious Boomers (and pragmatic X’ers) refused to recognize the damage that this breakdown was causing, it went too far. And this was caused by linear thinking that said, “We need to break down every institution and rule to the point there are none left that anyone can trust”. The same thing will happen again as part of this crisis, but in the opposite direction. As people pull together to deal with the heightening crisis, we will become more cohesive as a society. But the fears fueled by so many years of institutions being challenged will make organizations and individuals so passionate that they will shoot way past the balance point. We will come out the other side an extremely ordered and cohesive society, but it will be TOO ordered, TOO singular and it will fuel the next rebellion. This is the reason I believe understanding the generational cycles is so important. Accepting the cyclical nature of society gives us perspective on current and future events. Being able to see when change is occurring is difficult, but it will definitely help us avoid the extreme highs and lows which are caused by linear thinking. Posted on February 10, 2009 Categories GenerationsTags boomers, fourth turning, generation, generation jones, generation X, genX, howe, jones, Pontell, strauss68 Comments on Does Generation Jones Exist? Pelosi and Eugenics: 1932 or 2009? The clash of ideologies predicted by William Strauss and Neil Howe in “The Fourth Turning” is certainly hitting it’s stride now. I found an article that is particularly telling with regards to how these ideological battles are being fought. The article is supposedly about ridiculous spending items in the stimulus plan, but it has an interesting undercurrent. His commentary is mainly focused on Nancy Pelosi (who is part of the Silent Generation, born 1925-1942) and how she wanted to get birth control into the plan and had an extremely weak argument about why this should be in the plan. Navarrette draws a fascinating parallel to Margaret Sanger who was the founder of what became Planned Parenthood. Sanger was a controversial figure because she was in favor of Eugenics, which was a policy adopted by the Nazis to control racial makeup of society. Here’s the generational connection: according to the turning of generations we are at the beginning of the crisis (started in about 2005), perhaps only a few years in. If we look just a few years into the start of the previous crisis (started in 1929) we would come up with the year 1932. It is interesting that Navarrette would use an argument from that period to go after Pelosi. The similarity to that period is that there was a huge ideological clash going on and there was a battle for control of public perception, just like today. Like in my previous posting where Gore was accused of trying to brainwash kids like Nazi youth, I think we will see more and more of this sort of reference over the next few years. Each side in the ideological battle will try to paint the other as the absolute enemy, and referring back to the enemy in our last major crisis (the Axis) will be a favorite tactic. Watch for it. (if you are curious to learn more about the basics of generational research, go to “Start Here“. It includes links to Strauss and Howe’s original works as well as my interpretations). 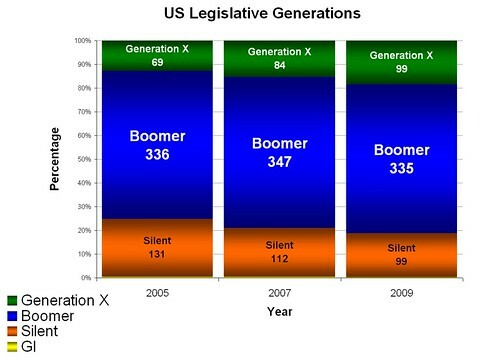 Posted on February 9, 2009 February 9, 2009 Categories GenerationsTags boomers, generation X, Generations, pelosi, politics1 Comment on Pelosi and Eugenics: 1932 or 2009? Want to know how to really upset parents of Millennials? Ask Al Gore, who managed to do just that by suggesting that teenagers not listen to their parents. This video from Glenn Beck’s show, which was recorded by one of the kids at the conference, and her father (probably a Gen X’er) was upset enough to go on the show and talk about it. This has been making the rounds at lots of conservative blogs, many of which are comparing Gore’s statements with indoctrination of Nazi youth. As a die-hard liberal, I don’t buy the politics here, but I think the generational aspects are fascinating. It’s not surprising that a Boomer (Gore) would suggest that kids rebel against their parents. That was the approach of the entire generation – knock down the institutions built by their parents (the GI Generation). But he made a HUGE mistake in thinking that this generation of kids (Millennials) and their parents (Gen-X and some Boomers) would react well to trying to divide them. Gore could definitely use some generational coaching. This is very much part of the battle that will unfold over the next 10 to 15 years as various Boomers try to convince the Millennials to follow their particular ideology. Asking them to rebel against their parents is unlikely to work (as the Millennials are generally very close to their parents), but that won’t stop Boomers from trying. The reaction of the Gen X parent is very typical as we tend to be a fairly over-protective bunch and don’t want representatives of institutions telling us how to parent. How could Gore have changed his approach to make it more likely to be heard? He could have appealed to the kids sense of purpose and tendency to want to work together. By saying something like, “We are all counting on you, the young people, to help change the world for the better. Your parents are counting on you. I am counting on you. The problems are big, but if we work together we will overcome them. And all of you will be a big part of that success.” By putting a positive message and tying their parents into the equation, he could have really gotten them on board. But, instead, he’s being accused of being an evil Nazi overlord. 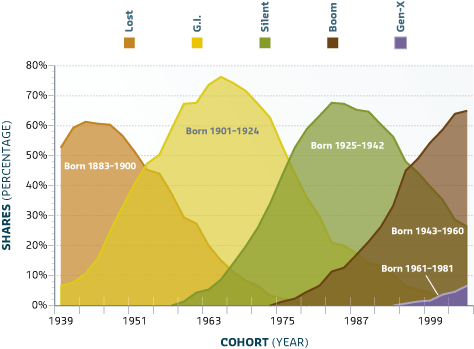 Part of understanding the cycle of generations is being able to see how the unique character of each generation varies as they pass through the stages of life. I created a chart recently to describe the attitudes of various generations as they passed through time. In this webinar I describe the chart, piece by piece, to give a better understanding of the cycles involved. You may want to view Part 1 of Understanding Generations first. You can download the hi-res PDF version of the chart.